If you went to sleep last night, you really missed out. 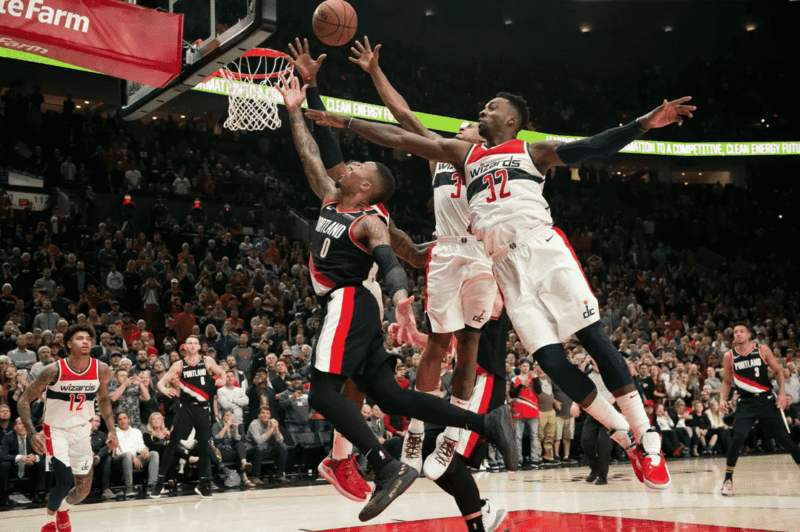 Otto Porter played like a max player, Markieff Morris had 28 points, Oubre had 22 points, and the Washington Wizards clawed their way to a 125-124 overtime victory over the Portland Trail Blazers. Markieff Morris was on fire last night, hitting six three-pointers and scoring nine points in overtime. He finished with a carrer-high 28 points and nine rebounds. Oubre poured in 22 points and hit three three-pointers which had many fans thrilled that he was starting to live up to his potential. However, despite the bench performance, the Wizards were saved by two defensive plays. One was a block from Bradley Beal on a Lillard drive in the fourth quarter. The other? Well, that was a block from Otto Porter on another drive from Damian Lillard to end the game. Coincidence? It wasn’t by far the best performance the Wizards have had, they played the ugliest third quarter of all time scoring just 16 points. Wall and Beal could not buy a bucket but, somehow, they got the win. A win is a win. And that was huge as they will travel to Oakland on Wednesday to play the defending NBA champions. Finally. Otto Porter had the value and play of a max player for the first time since his new contract was given out. His numbers weren’t huge, but he was aggressive and had his hands all over the game. He scored 16 points, grabbed 10 rebounds, snatched two steals and had the game sealing block playing as the team’s power forward for most of the night after Ian Mahimni left the game early with a sore back. Porter did all of the little things, posting up smaller guards and pushing the ball in transition. He also led the team in minutes with 44 after only playing 24 on Saturday against Toronto. Scott Brooks called Porter out during his press conference yesterday so that must have sparked him. Hopefully, he continues to play like this. This is by far the best lineup combination the Wizards have to date. Wall at point, Brad at the 2, Oubre at 3, Otto as a stretch 4 and Jeff at the 5. I hate to see a player get injured, obviously. But once the Wizards pulled Jason Smith out of the game and brought in Jeff Green, the game changed. The Wizards also worked a great small-ball unit with Keef as the center as well. The Wizards talked a lot during the offseason about going small and no one knew how it would work. Some teams have had disastrous results but for the Wizards, it has worked out differently. Oubre and Porter in the game at the same time serves two purposes — it gives Porter the space and matchups he needs to create opportunity for himself without the ball and it also gives Oubre a chance to play fast with Wall. Sure, the bench may not be as productive but it is a lineup combination that works. Quite frankly, the Wizards do not have many of those at the moment. There’s a solution here, and hopefully Brooks can find it. But last night should open a lot of doors for this team. While Wall didn’t have the best of games offensively last night, he still looked large on defense. This is not a usual topic to bring up when we talk about John Wall as he has shown laziness over the last two years on that particular side of the ball. However, did you look at the last three games? He’s All-Defense material. Damian Lillard and CJ McCollum combined to shoot 12-46 from the field. Lillard made most of his shots off of free throws and McCollum went off while being guarded by other guys, but both couldn’t muster anything when guarded by Wall. The best part? He played 41 minutes guarding those two with not a single foul. He couldn’t hit the broadside of a barn last night with his shot, but he was still a factor because of what he did defensively. If he keeps this up, the Wizards’ turnaround will be fine.